Arobas Music is first and foremost a young, dynamic team of 14 people. Developers, musicians, webmasters – all are committed to offering a professional-level, top-quality electronic support for musical edition. 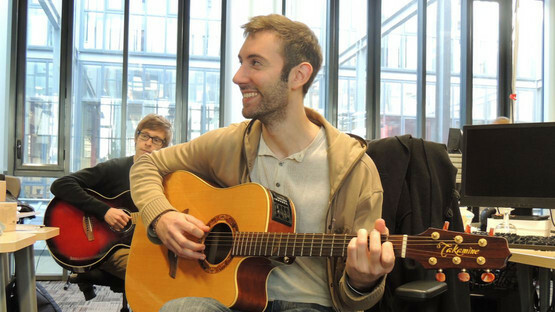 Our ambition is to offer guitarists an ideal environment to learn, practice and compose their music. Our values ​​are to design a product that meets the expectations of our users, at an affordable price. We are always listening to our customers to change the software in its functionality while maintaining ease of use. We build and maintain lasting partnerships with companies around the world doing guitar teaching/content and creating technology. Their expertise enables us to do far more than we could alone, and their passion and talent inspire us. You’ll find the Arobas Music team in Euratechnologies, a cluster of Technological and Information Technologies located in the heart of the glorious city of Lille, in the North of France.